We were woken at 5.45am by the tannoy announcements and neither of us were very keen to get up. It had been a very bumpy night and we still felt tired. As we were the second vehicle off the ship and as it was still early morning so not too much traffic, we were soon on our way. The journey out of Melbourne was much easier than our one to the ferry terminal two weeks ago. A breakfast stop was made just before we left the motorway and we headed through Geelong to the start of the Great Ocean Road at Torquay. As it was a Sunday everywhere was very busy but there are many car parks along this part of the road so we had no problems stopping at each lookout. 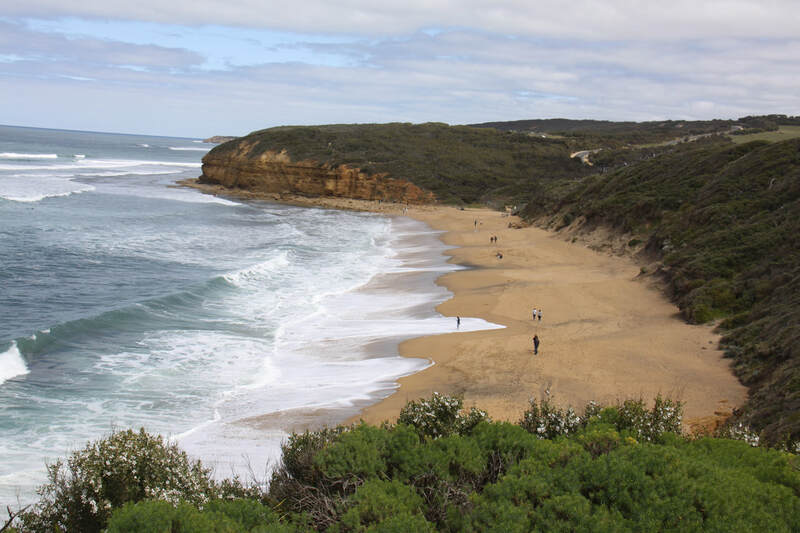 Torquay and nearby Bells Beach are both excellent surfing beaches, some might say the best in the world. 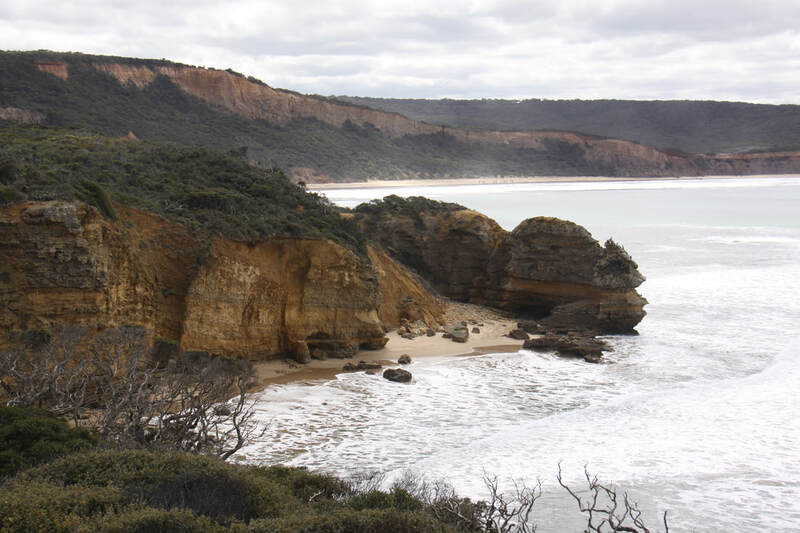 Although overcast, the views from the lookouts, especially at Point Addis and Split Point Lighthouse, are absolutely stunning - surf crashing on sandy beaches, wave cut rock platforms, offshore stacks and orange hued cliffs. 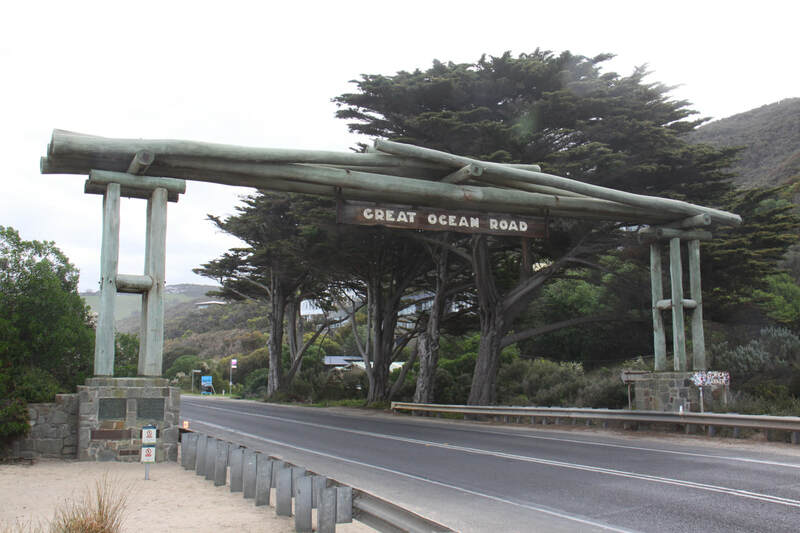 The Great Ocean Road Memorial Arch, which straddles the road, and a statue to the men who constructed the original road, stand between Aireys Inlet and Lorne. There are no 24hour rest areas along the Great Ocean Road so our night's halt was at a campsite at Cumberland River. Here, the river has carved a sheer cliff face out of the rock. 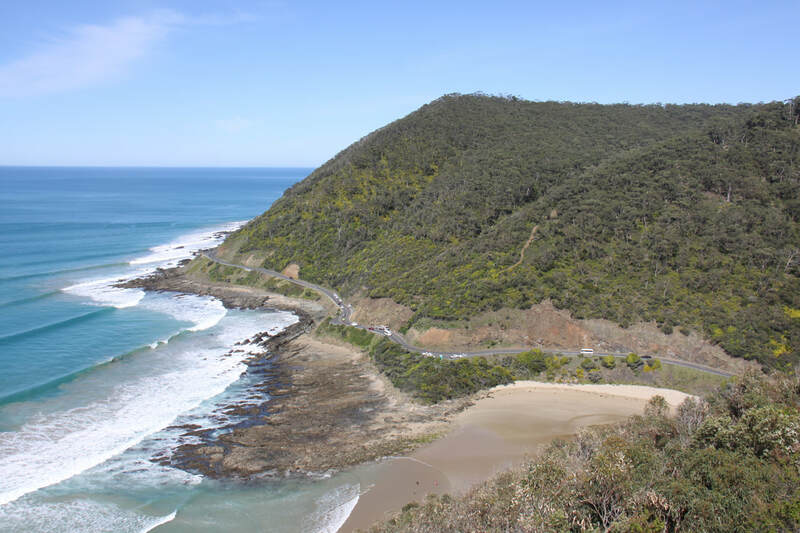 This coastal area is part of the Great Otway National Park. First thing this morning we headed the few kilometres back to Lorne - it was good to have another chance to travel this amazing stretch of the Great Ocean Road. Here the road hugs the coast with fantastic views across the incised river valleys. Deafening surf pounds the rocky wave cut platforms while at each valley, golden sands and often a lone surfer can be seen. The road is cut into the cliffs as it twists and turns along the coast. At Lorne we went to the Tourist Information Centre where the Great Ocean Road National Heritage Centre is located. This is a small but well presented exhibition featuring the construction of the road mainly by men who, having fought in World War One, needed work. 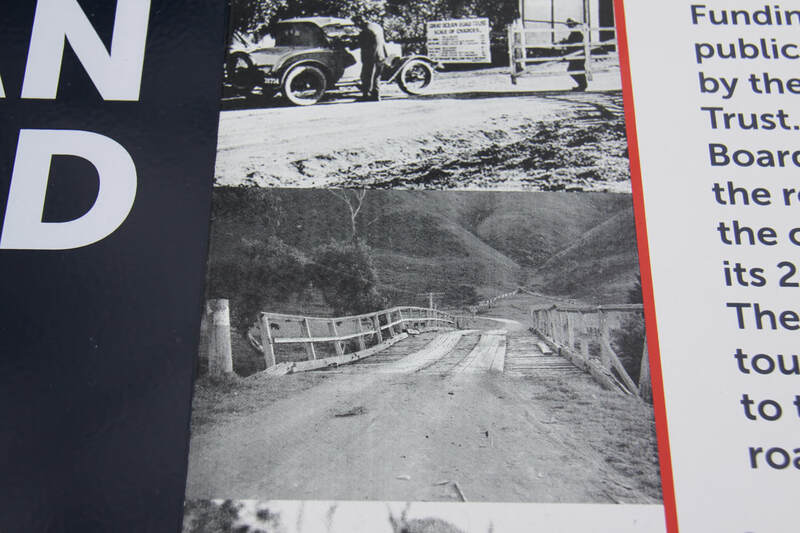 The road was finally completely opened in 1932. Teddy's Lookout on a bluff above Lorne, gave us a wonderful view west along the road. Erskine Falls inland from Lorne were worthy of a quick visit but at this time of year, with no rain, were not particularly impressive. After Lorne we continued to drive west with frequent stops at the various lookouts. We stopped at Kennett River for lunch as it is supposedly a good spot to see koalas sleeping in the trees. We went in search of them but unfortunately they were too well hidden. Rosellas, parrots and lorikeets were easier to spot. The road continued close to the shoreline until Apollo Bay from where it headed inland passing through dense woodland. We then turned off onto the road to Cape Otway. Just short of the cape was Bimbi Park, our destination for the night. Our pitch was surrounded by manna gum trees evidently inhabited by koalas. We still didn't see any! Last night was spent very close to Cape Otway so within a few minutes of leaving Bimbi Park campsite, we were at the carpark for the light station. We were rather surprised to find there was an entry charge for the lighthouse, all the others we had visited were free unless you wanted to go up them, but once inside the complex, we realised there was much more than just the lighthouse to see. 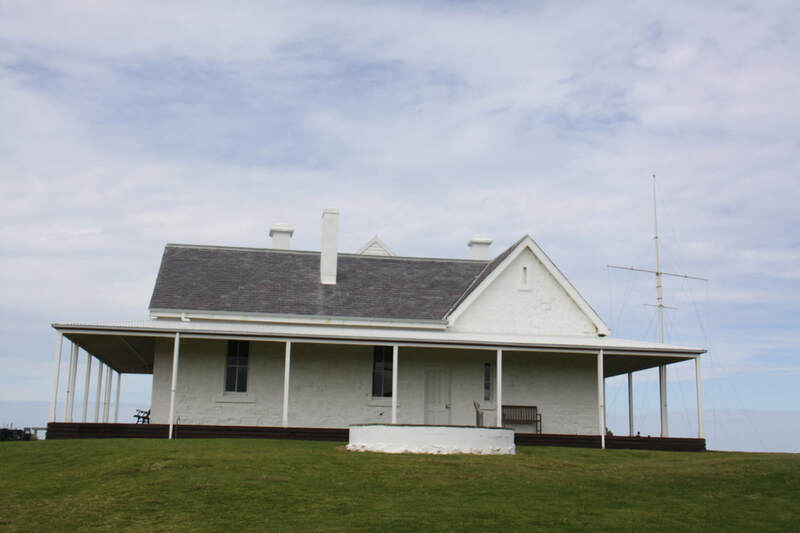 Cape Otway Lighthouse was built in 1848 and as such is Australia's oldest. (One other lighthouse had actually been built before then, but it is no longer standing.) Cape Otway is Australia's second most southerly mainland point. As a lighthouse it was very important as the shipping lane here, was known as "the Eye of the Needle" because ships heading for Melbourne had to round the cape and keep well north of King Island. Near to the lighthouse was a telegraph station dating from 1859. Originally built to communicate with Tasmania, the cable was unfortunately broken by rough seas so often that they gave up after two years and used it to for messages around Australia. The building was complete with morse signalling equipment, semaphore flags for the adjacent flag pole and the original furniture. Descriptive panels informed the visitor, not only how the telegraph station functioned but also about the lives of those who worked here. A number of keepers' cottages are dotted around the site and a World War 2 radar base sits on the cliff top. There was also a Whale Viewing Platform on the edge of the cliff with descriptions of the whales often seen here but there were none today. However, the views over the Bass Strait and Southern Ocean, with the pounding waves were spectacular. The climb to the top of the lighthouse was easy and the 360 degree views were dramatic. The importance of the lighthouse is highlighted by the fact that, despite modern navigation methods, it is still in use today. It was easy to see why the light station is heritage listed within the Great Otway National Park. 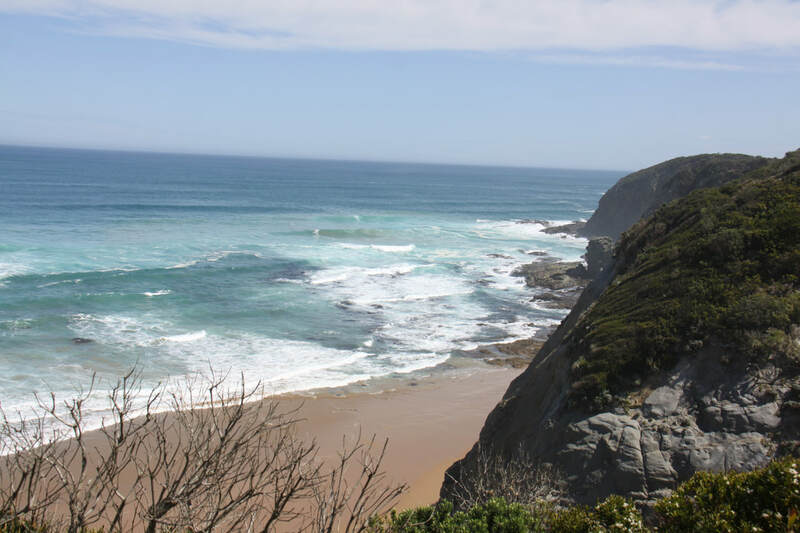 We returned to the Great Ocean Road which at this point cuts across the neck of the cape for some thirty miles before briefly reaching the coast again at the beautiful Castle Cove near Glenaire. We were not to touch the coast again until we reached our overnight halt at Princetown. The charming, peaceful Apostle Camping Park is on well kept grassy terraces high above the Gellibrand River. A five minute drive this morning brought us to Gibson Steps, our first stop of the day along this fascinating coast. Here, a flight of 86 steps lead down the cliff face to the beach below. At low tide it is possible to walk along the beach to view Gog and Magog, a pair of stacks just off shore. As it was high tide we could only see Magog although once back up the steps we saw both stacks as we drove further along the Great Ocean Road. Just a mile or so further along the road, we pulled into the carpark for The Twelve Apostles. The Visitor Centre was a disappointment, just a gift shop and a few information boards. A tunnel led under the road to a well marked track with viewing points. 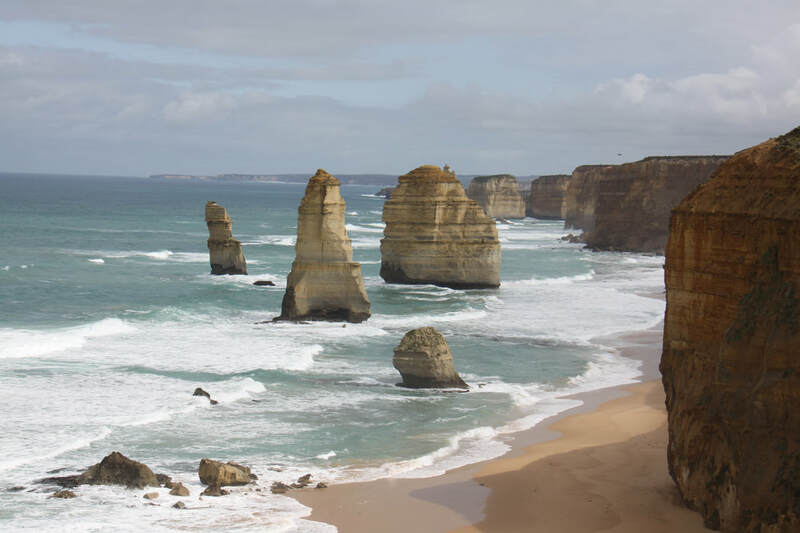 The name "Twelve Apostles" is somewhat confusing, as there aren't twelve at all. Apparently there were thirteen when they were first named, now it depends where you stand to look at them. Even the tourist guides can't decide whether there are seven or eight! The only thing they seem to agree on is that one collapsed in 2005. The limestone stacks vary in height, some rising over 65 metres above the water, others which have been eroded longer barely visible above the level of high tide. The coast is under constant attack from the waves of the Southern Ocean. Estimates are that it takes 600 years for a headland to be eroded by the elements. First cracks appear in the cliff, as the waves pound the cliffs an arch is formed which eventually collapse to form two stacks. These eventually collapse or are eroded away and the whole process continues. Three miles further along the coast is Loch Ard Gorge and Mutton Bird Island. In 1878 tragedy struck here as the clipper "Loch Ard", sailing from London to Melbourne hit a submerged reef of the tip of Mutton Bird Island. Faulty navigation equipment was to blame - the captain thought he was fifty miles out to sea! All but two on board drowned and despite the wreck being so close to shore, only four bodies were ever found. These are buried in a windswept cemetery above the gorge. The two survivors were 18 year old Tom Price and 18 year old passenger Eva Carmichael. Tom battled his way ashore only to hear Eva's cries for help. He swam back to rescue her. Next day, he scaled the cliffs and fetched help. Mutton Bird Island is an important breeding ground for 50,000 "mutton birds" (shearings), where they are safe from predators. Each year they migrate to the Aleutian Islands in Alaska. Walking back to Nicolle it clouded over, got much cooler and windier and started to rain heavily. We headed to Port Campbell for lunch. After lunch we visited the Port Campell Visitor Centre which had a fascinating museum detailing the various shipwrecks along the coast and displaying items recovered from them. Tonight we spent at Port Campbell Recreation Reserve Campsite. Unfortunately today was cold and blustery so we didn't have the best of days for our final day along the Great Ocean Road. Our first stop was at The Arch. 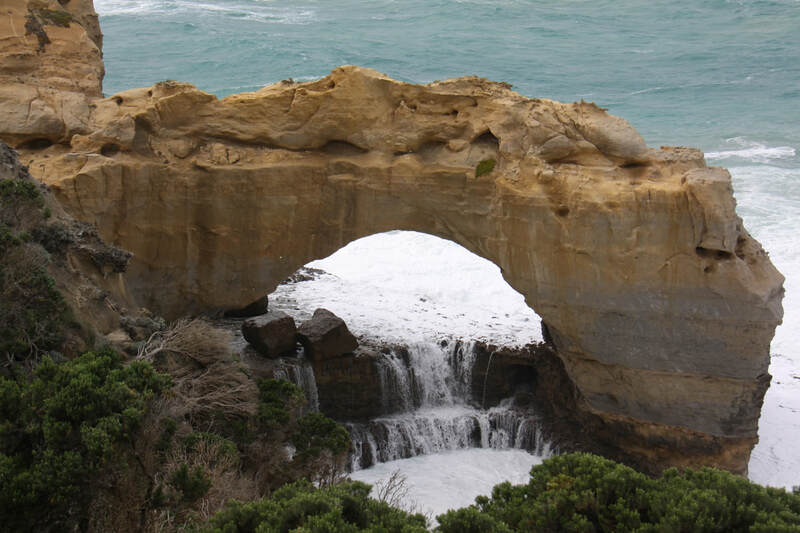 Here the two coloured soft sandstone rocks have been carved into an arch with a rocky ledge of harder rock forming a wave swept step below. 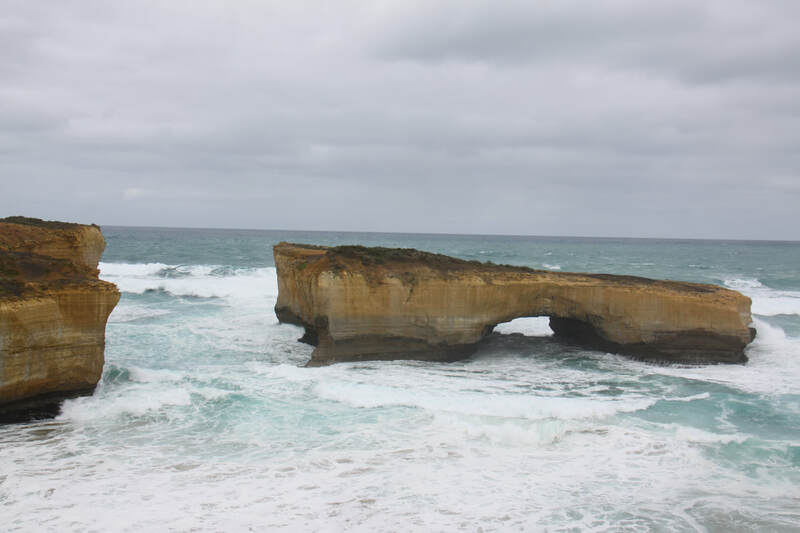 Not much further along the coast was the intriguingly named sandstone rock formation known as London Bridge. This feature was originally a two span bridge arch until the inner arch collapsed in 1990. Two people were stranded on the outer side so had to be rescued by helicopter. Apparently they were having an extramarital affair so rushed off before the waiting press could interview them! The next viewing area was at a feature known as the Grotto. Here a cave and a sinkhole, located roughly halfway up the cliff, are battered relentlessly by the sea. On a rough and windswept day like today, it was quite a sight to see the waves breaking on the ledge at the edge of the cave and flooding the tiny pebble beach. Bystanders on the viewing area, including ourselves, were covered in spray. It was a fitting end to a wonderful drive along the cliff edge. 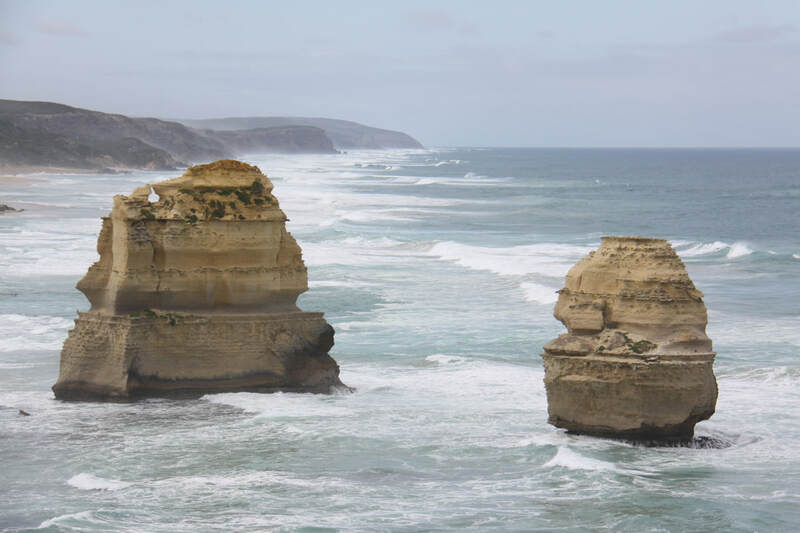 Our last stop on the Great Ocean Road was at the Bay of Islands where there are a dozen or more sandstone stacks surrounded by the swirling surf. After lunch we drove to Warrnamboal, a sprawling service town for the area, to visit Flagstaff Hill Maritime Village. Here various historic maritime buildings have been gathered together to form a typical coastal settlement and wharf, indicative of the late 19th century. There are also two lighthouses and a garrison. As it was school holidays children's workshops had been organised for woodwork and jewellery making. On entry to the site you pass through a very interesting museum which features details of and the original artefacts from the many shipwrecks that have occurred along the Shipwreck Coast. We stopped for the night at Killarney where we were lulled to sleep by the sound of the surf crashing onto the beach just over the sand dunes from where we were camped.